Hi Bubby and Bean readers! 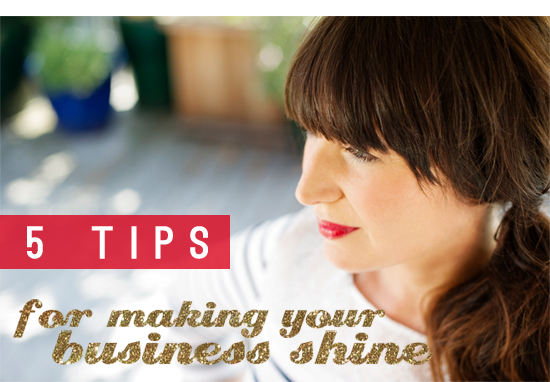 I'm Julie from Olivine's Charm School, and today while Melissa's on holiday in Mexico, I'm going to sharing my 5 tips for making your business shine! 1. Write down your dreams and goals for your business in 2012. Ok. Now do you have a long, disorganized, anxiety-inducingly list in front of you and no idea where or how to start? Good! That means you did it right! Look at your list, and choose one thing that's extra juicy. Now break that task down into tiny little steps that aren’t so overwhelming. Just ignore the rest of the list and only focus on this new, much shorter and less stressful list. See how suddenly that one task seems totally doable once it's broken down? Now take one of your baby steps, and do it today! 2. Make your work space shine. For me, it's really important to have a designated work space that is full of inspiration and not full of clutter. This one is simple: just clean up your mess. For some reason, when my work space looks pretty I make more money. It could be Feng Shui, or it could be that when our spaces are cleared we feel good. When we feel really good people want to spend their money with us. Make a vision board for your business and hang it somewhere front and center where you can get inspiration and re-focus from time to time. 3. Surround yourself with successful people. It's great if you have a huge group of friends that party all night and go to their desk jobs all day, but now is the time to expand your circle to include as many people as possible that are doing what you want to do. I gave this suggestion to someone once on a consulting call and she was sure she couldn’t do it because she lived in a small town and there simply wasn’t anyone around that inspired her. I had her send emails to three people that she looked up to in her field. She sent simple emails that were along the lines of “Hey, I think what you’re doing is awesome”, which is a very non-intimidating way to send an email. She now has a circle of online (super inspirational) friends that she checks in with regularly. Reach out to one person today! 4. Get over your fear of self-promotion. I understand, self-promotion is scary and intimidating. Today is the day to practice talking to yourself in the mirror about what you do. Come up with your 2-3 sentence cocktail pitch about your business, make it fun and enticing. "I am a personal trainer" is very unexciting and I would not want to hire you. "I am a personal trainer and I mostly work with new moms who are trying to get their abs back!" would make me want to hire you and/or tell some friends. 5. Turn your computer off, put your cell phone on silent and get a pedicure. When we are starting a new business or trying to run a business it is very easy to put our self care on the back burner, when in reality that should be at the very front. Always, always, always make time to do something for yourself daily. It could be as extravagant as a pedicure or it could be something as simple as taking five extra minutes in the morning to close your eyes and breathe. Because honestly, if you are following the first four steps then you will soon be lost in a sea of business and opportunities. If you don’t stop to admire yourself, relax and enjoy the process then what was it all for? Try out these tips and let us know what happens! If you'd like to learn more about how to create a charmed business or to make your existing business sparkle, be sure to check out my online small business class, A Lovely Venture: Creating Your Charmed Business. Thank you so much Julie for this seriously amazing post! Julie is truly a small business guru you guys. She's owned and operated six successful businesses, and she really knows her stuff. Her blog is an incredible place for advice, inspiration, and encouragement. And her small business class comes highly recommended. Be sure to check them out! i agree! those are some great tips! thanks! I struggle a lot with the self-promotion thing. I can do it online no problem, but if I'm facing another human... lordy. I get all awkward and make my husband do a lot of the talking for me. Thank you so much! I love doing this myself at the beginning of each year but you have given me some new things to think about! And I especially agree with making your work space pretty, I know I get distracted by disorder when I work! Oh my gosh. I needed this today. I was actually just looking at a huge list of things to do and was starting to feel panicked. But this really put everything into perspective. The self promotion one is the hardest for me - I always feel like a bit of a fraud because I'm so not used to selling myself. But the cocktail pitch is a great idea. Thank you! Great tips specially tip #2:Make your work space shine. I just love it when my workspace is so organized cause it inspires me to create. Followed you from Blogging Buddies.